A hack made by Ax461 and triumph. Based on the Creepypasta of Pokémon Black. Read it here. ●Game Opening like Original Creepypasta. ●Lavender Town's GHOST as a playable Pokémon, automatically added to Party after Starter Select Event. ●CURSE move for GHOST on Pokémons and Trainers. ●Pokéballs disappear result of CURSE. ●New Type ??? for GHOST. ●GHOST cannot be removed from Pokémon Party. ●Tombstones of cursed trainers in all maps. ●"Many Years Later..." and other changes post Elite4. Let us know any bugs you find, we'll be working on them. Also if you're interested in contribute or join, send to Ax461 or me a PM. The current version of the hack ends after Elite4, and has some bug fixes. For those who want it in a cartridge, this was inspired by the Game & Watch Gallery 2 (thanks to Ax461 for finding the cartridge source) and Pokémon Red label. This hack wasn't intended to encourage people to harm or kill another people, not even encourages suicide. It's just a horror game like any other out there. We made it for the love to the original creepypasta and for fun. I think most of the players understand this, but sometimes others not, that's why I write this warning. With the necrobump set in place, I'd like to point out an inconsistency. First off, the creepypasta itself didn't let you choose GHOST as a starter, it was already in the players party. However, you can correct this by "adding" the Pokemon once a normal starter is chosen, but this might also trigger prevented progression due to the Oak's Parcel sidequest as explained here. This next bit is merely a creative suggestion, but if there only was a way to make the music's pitch and speed lower on specific spots where you enter a certain town only once, whereas Pallet Town is the final destination. Once Pallet Town is reached on the final script, the music would be scarier. In the final battle with GHOST, it would be at it's scariest to the point where it wasn't the whole Lavender Town theme, so this could be considered custom battle music just for that situation. A true finality, if you will. This is basically my input on what Pokemon Black (GB) was meant to be like. EDIT: Also putting this video here as well, since it is possible to create a creepy cry with the right tools in pokered. I started working on this hack on my own before i saw this post, and in my version GHOST is added silently along the starter (no nickname prompt for GHOST), and it doesn't cause any problem with Oak's parcel quest. I also hope that the OP didn't "die" of natural causes. This project supersedes the GBA version, which gives no real feeling of uneasiness. This is the most sought after version, at least for me anyway. I believe that this will soon become a reality. Soon. About time, I've been absent a long time, and just right know I was wondering what's new on this forum and I'm happy to see people interested. The proyect is frozen because I have a lack of knowledge and skills in Pokémon Hacking, but we can still make it real. First off, the creepypasta itself didn't let you choose GHOST as a starter, it was already in the players party. This is how it works, you can choose any normal starter, then: "RED recieved a CHARMANDER!" "Give a name to CHARMANDER? (Y/N)" and then it shows: "RED got GHOST!" (because it's made with "call GivePokemon") after that the whole game runs good with your starter and GHOST in addition, I tested and it runs very well without issues. I just don't know how to remove that message of "RED got GHOST!". This next bit is merely a creative suggestion, but if there only was a way to make the music's pitch and speed lower on specific spots where you enter a certain town only once, whereas Pallet Town is the final destination. Once Pallet Town is reached on the final script, the music would be scarier. In the final battle with GHOST, it would be at it's scariest to the point where it wasn't the whole Lavender Town theme, so this could be considered custom battle music just for that situation. A true finality, if you will. I really like the suggestions of the music and the cry for GHOST. But this kind of ideas (and some more I have to make it even more darker) I think it could be done on an "Expansion Version". Because I already love the Creepypasta as it is and I want to be loyal to it, and after that, release a version with much more creepy stuff so fans can enjoy both sides. That's excellent news! I'll contact with you as fast as I can. This project will not die, I already made several backups to keep it alive. I just need more support. Ah yes, I almost forgot about that bit, though I don't remember if there is a script to secretly give the Pokemon in R/B/Y, especially considering that Crystal_ did it for the Challenge Cup modification. However, I don't mind simple stuff in order for it to be released in a somewhat completed state. You are free to make it like the original story if you wish, but I do think this kind of music walking back to the player characters original location would be more unsettling, like a feeling of dread looming over ones head. However, this is only based on a personal opinion. Yet, in the final climatic battle with GHOST, the original author of this story didn't bother to write about the music that plays while it goes on, so I was only interpreting what it would sound like. For the cut to black, music turns off and makes an indirect call to 35D6, then it freezes. It's just like the original story, erasing ones game data without any "file is destroyed" text. You have my support on this, but I don't know ASM or anything. I only know what is scary, and things that kill the illusion of fear. Lost Silver's fangame had the R/S/E select sound effect, as well as non-faithful loading times. The non-DMG Lavender Town echoes aren't very scary since they aren't faithful to the Gameboy. Finally, Snow on Mt. Silver's game and video has all kinds of issues, while the "game" had heavily edited "death" sounds for Pokemon when the original G/S/C didn't bother to play a cry when a Pokemon had fainted, or died in that case. Regardless, I'm going off-topic for a bit, so good luck with your hack! Well this is very useful, I didn't read it before! Currently on the hack, I'm having an issue with the "empty world": after beating Elite4 you can walk anywhere in the map with the Lavender Town music everywhere and with the Old Man sprite and is totally empty, but when you enter a house the game crashes, and I still have to fix this to then, start with the Final Battle. I recommend you to wrote your expectations and ideas on a text file, so depending on what I can do, add that to the "expansion" (It could be called Endless Black or something like that). That GHOST's cry is awesome. I remember reading the CreepyPasta a few years back and seeing someone do a Let's Play of a Gen 3 ROM hack based on the Pasta. Say, I've always been wondering, what would happen if you played through this hack normally without using the Ghost? According to the original story, it would still end with the climatic scene between your player character and GHOST. But the game is meant to be dark, there are no happy endings to be had here. Only a short victory which ultimately led up to death. Oh yeah, and the Gen 3 hack of it is weaksauce. Makes the creepypasta more of a joke and not a serious story, in my opinion. This is gonna be possible on the hack and there's no gonna be other options. We don't started with this part yet, but we're on the way to it. This looks really promising. Real life creepypasta games are super neato. Now all you gotta do to really seal-the-deal is to put the rom in a cartridge and give it away. I'm interested in helping, and I've sent you a mail. Seems promissory. I'm excited to play it when it get 100% finished. I'm impressed with your work. However, I have a bunch of things to say. First, I'll give you some suggestions, you can add them to the expansion or to the normal version. 1. The minisprite for the Pokémon Menu looks great. That aside, I think it doesn't fit. In Gen 1, over a third of the PokéDex had that “monster weird thing” minisprite. An example is the Gengar line, they all had it. This changed in Gen 2, where they would have a cute Gengar instead. Ghost having its own sprite is too good for Gen 1. That monster weird thing fits better imo. 2. A little detail for making things scarier. After Ghost kills a Pokémon/trainer, before the “Ghost gained 25 EXP” message (or the fade to white) there should be a message saying “...” without any music in the background. That would make clear what happens when “curse” is used, it'd also add some suspense. 3. I'm guessing that the Lavender Town song plays after the “Many years later...” no matter where you go, just like in the creepypasta. But, I think it would be better to have silence, at least until the player gets to the starting point. Silence, in my opinion, is also a sound. It would be scarier than a song everyone knows and which is the main subject of Pokémon's most popular creepypasta. Hearing LT's song over and over would be more repetitive than scary. However, it should start playing when the killed Pokémon and trainers are shown, getting a lower tone as the gallery goes on. LT's song on a low pitch is one of the scariest things you can hear. 4. There is a version of the creepypasta which I consider superior to the original. It's a visual novel for the NDS called "Pokémon Black: Retold". You can find it on YouTube or here if you want to read it with an emulator (or a NDS). I think you should add the ending of this version, you'll get what I'm saying if you read it. 2. Red throws the ball, it opens on the wrong side, then the animation of the ball shaking would appears on enemy's side while Red's Pokémon seems to be gone. The ball keeps shaking until, suddenly, the enemy Pokémon fires a beam and the game starts to glitch in a terrific way. I have to say it's fun to watch. I started a new game but nothing changed. I think the results of throwing a ball depend on what Pokémon you're trying to catch, as the ball was blocked when it was Pidgey or Rattata, and the beam thing would happen when it was a Weedle or a Kakuna (maybe the Weedle line has powers we don't know). It happened in the Git version of the hack. One last thing. 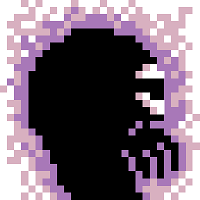 Some weeks ago, I made this back sprite for Ghost. It fits perfectly in the game, I tested it myself. Feel free to add it, it'd make me very happy. Is the full rom hack close to being finished? I ordered a cartridge for this and I'm waiting for it to be delivered and I'm guessing it doesn't have a full version of this on it and I hope there is a way I'd be able to put the full version on it when it's released. I stopped developing it due to not having enough time anymore, so you can consider version 0.05 the final one. That's a shame and the guy who sold me the cartridge made it seem like it has a full version of the hack on it. I guess I'll find out whenever I get it delivered. I'd literally pay you to finish this. That's how bad I want a complete version. It wouldn't be hard to make a non-faithful complete version in a short time, the only difference would be that in the final cutscene (before the ghost battle) the background of the mons and trainers would be white instead of black. Making a black background that looks decent for every pokemon/trainer requires a lot of time (especially for trainers), since it needs to be done by hand. I could make this compromise if you want a complete version so bad, but I don't want money for this. What about inverting the colors? It could be done with a palette swap instead of custom silhouetted backgrounds, and the effect is potentially an improvement.